If it’s mid-January you know many thousands of people, ranging from students to the elderly, will be heading for Washington, D.C., for the annual Rally and March for Life. That is the enduring protest of the Jan. 22, 1973 U.S. Supreme Court decision that effectively legalized abortion on demand throughout the United States. Among that throng will be thousands of people of all ages representing parishes and schools of the Philadelphia Archdiocese. But of course, the march is not exclusively Catholic. Traditionally the pro-life event has been held as close as possible to the Jan. 22 anniversary, although the organizers learned early on to avoid weekends because the streets are empty and government offices closed. This negates the desire of many to stop in at the office of their senator or congressional representative to voice their opinion of Roe. This year the event will be held on Friday, Jan. 18. In a change for at least the next five years, according to the March for Life organization, the march henceforth will be held on Fridays near the Jan. 22 date. Friday is more convenient because of events surrounding the anniversary, explained Steven Bozza, director of the Office for Life and Family for the archdiocese. For example, on the evening of the march there is the annual Rose Dinner that draws pro-life leaders from around the country. It is more convenient for many of them to stay at least overnight, rather than return home for a workday. Also, on the next day, which is Saturday, this year there will be a special youth rally for young people who stay in Washington. Bozza believes a number of Philadelphia youth will remain for the Saturday event. While there is not an accurate count as of yet of the number of buses traveling to Washington for the March for Life, inquiries are stronger than they were last year when between 3,000 and 4,000 people made the trip, mostly on buses from area parishes, colleges and high schools, according to Bozza. “There seems to be a lot more interest this year and things are moving right along,” he said. Bishop John McIntyre, who oversees the Office for Life and Family in the archdiocese, will travel to Washington a day early to concelebrate at the opening Mass of the pro-life observance at the Basilica of the National Shrine of the Immaculate Conception. He will also concelebrate at the 10 a.m. Mass on the morning of Jan. 18 at the basilica, which is traditionally attended by many Philadelphians. This is considered the Philadelphia Mass but Archbishop Charles Chaput can’t attend this year because he is recovering from knee surgery, Bishop McIntyre explained. The seminarians from St. Charles Borromeo Seminary, led by their rector, Bishop Timothy Senior, will attend in force. 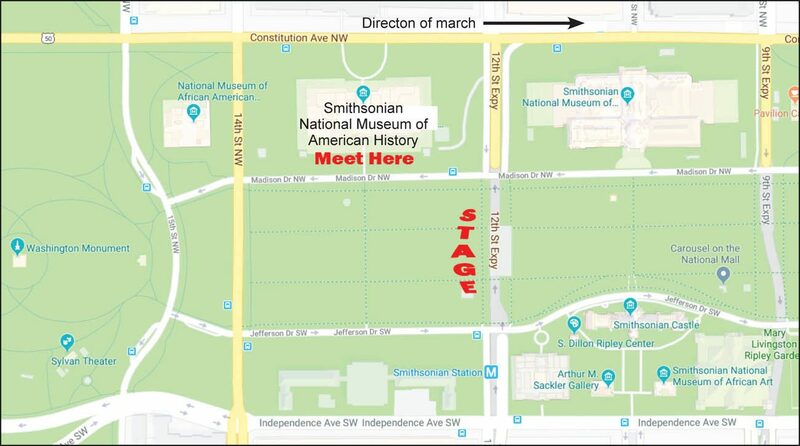 For years those coming to the rally have been urged to join with the seminarians near Constitution Avenue for the rally and then march with them up past the Capitol and ending at the Supreme Court. For the most part this suggestion has been an exercise in futility, mainly because that particular location is so congested with marchers from around the country it is virtually impossible to connect as a single group. This year the Philadelphia contingent is urged to join with the seminarians on Madison Drive near the Museum of American History, which is usually much less congested. But some people, depending on times they leave locations in the Philadelphia Archdiocese, will not arrive before the march following the rally actually begins. A good number of the Philadelphians are going by buses that park at the Basilica of the National Shrine of the Immaculate Conception. Many will attend Mass there before continuing by subway to the area of the rally and march. “We try to remind people of this tragedy and promote people going down,” said Tom Stevens, president of the Pro-Life Union. Among other local events on the same day as the Washington rally and march, Stevens said, is a prayer rally at Planned Parenthood in Warminster. On Sunday, Jan. 20 in West Chester a prayer service will be held at St. Agnes Church at 2:30 p.m. followed by a local march to the Chester County Courthouse. Hosted by the Chester County Pro-Life Coalition, it has been a tradition for the past 26 years.